I don’t have a schedule. I wake up in the morning. I lay there for a while. I don’t have a job, so there’s no getting up and going to work so I can make a meeting. I don’t have close friends, so there’s no venturing out to make a breakfast or lunch appointment so I can talk about what’s going on in my life. Eventually I’ll get up out of bed to use the bathroom. After that I find myself cascading to the kitchen for food since hunger is surfacing in me. I’ll chew the food and swallow. Things feel better. Then I sometimes go back to lay in bed. Or I might go outside and stand in my backyard. Laying down and standing are similar experiences for me. There’s not much movement. It’s not tiring. And I don’t have to make decisions or think if I’m doing it right. At some point during the day I take a time travel trip. It’s never planned. Suddenly I get a feeling to go somewhere in time, I step into the time machine, I punch in the coordinates, and then press the Go button. And then there I am. I did this today when I went to April 4th, 1841 and the White House in Washington, D.C. 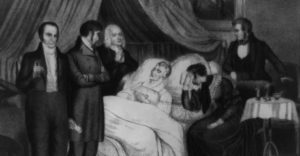 The President, William Henry Harrison was on his deathbed. He’d only been President for a month. His doctors were applying leeches to his chest in a final attempt to keep him alive. Harrison had enough, pulled off the leeches, sat up and said, “Life is a struggle to stave off death, but death waits peacefully, mouth open for its inescapable meal.” President Harrison fell back into the bed and died. I returned to my time machine and came home. I sat down on my living room floor. I have a sofa, but I always sit on the floor. The sofa makes me sleepy. The floor is firmer and makes me feel alert.